I've compiled some video highlights from Nintendo's Electronic Entertainment Expo Wii U game introductions. The video gives you a quick sneak peak at some of the games and features you can look forward to on this new gaming platform launching later this year. 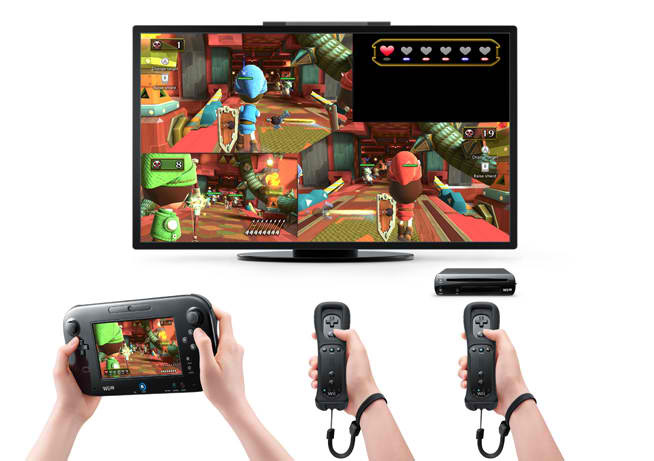 Overall the Wii U's game graphics looks like higher resolution versions of what you are use to on the original Wii. But it is clearly a more powerful system and does feature some 3rd party games similar to what you see on an Xbox 360 or Sony Playstation. While it wasn't announced, Microsoft and most likely Sony will have their new gaming systems at next year's show for launch during the 2013 holiday season. So for a brief period of time, Nintendo's graphics will be on parity but we'll have to wait and see just where Microsoft and Sony take their platforms to see if Nintendo will once again lag on the platform wars. Now Nintendo has proven time and time again...it is all about the games and not graphics BUT the issue is that a 3rd party publisher like Ubisoft, EA or Activision want to release their titles on all platforms and Nintendo typically suffers from the fact that it's platforms are not able to accomodate a port of game from the other systems. So 3rd party content tends to be limited to what companies want to make Nintendo original content or heavy-duty/stripped down version. For launch, since the Wii U is in the ballpark of Xbox 360 we are seeing some ports like Assassin's Creed 3. But this will probably dry up after the first year.